GIS enriches high-impact higher education learning experiences. Field data collected by undergraduates is easily incorporated into ArcGIS. Visualization of field measurements enhances comprehension of spatial concepts. 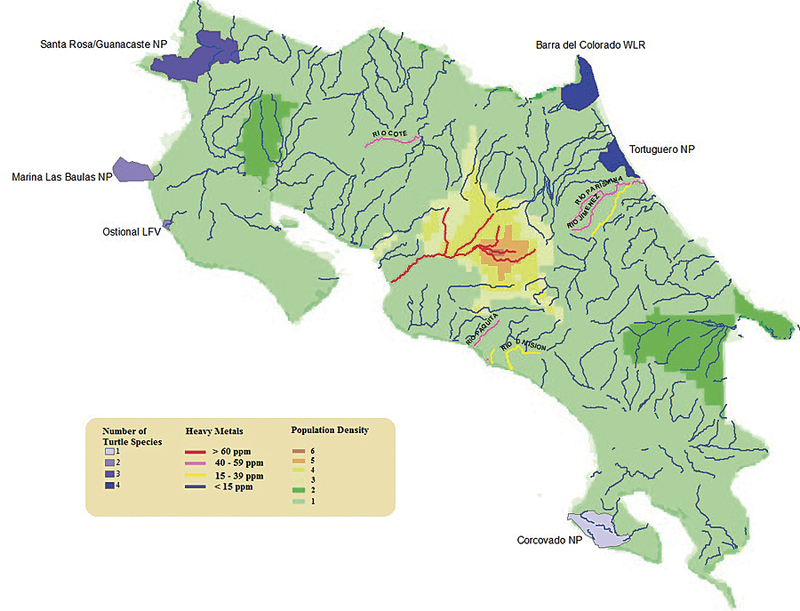 Using ArcGIS for Desktop in the lab, authentic Costa Rica field data was joined with existing GIS layers. Rio Parismina and Rio Jimenez (labeled) do not flow from heavily populated areas yet show elevated levels of heavy metals. These rivers flow toward a nesting area for multiple sea turtle species. "The results clearly show that colleges and universities should do everything possible to encourage undergraduates to participate in at least two high-impact activities, one in the first year and one later in their studies. Such experiences will better prepare students for a productive, satisfying lifetime of continuous learning." With the emphasis now placed on high-impact practices, professors face a sometimes daunting task of developing and offering engaging, impactful learning experiences for their undergraduate students. GIS can serve as an excellent tool to enhance such lessons and complement high-impact experiences in a variety of fields and disciplines. A recent summer research project offered an opportunity to couple high-impact learning practices with ArcGIS through an Esri educational teaching and research lab kit. One professor and two undergraduate students at Washington & Jefferson (W&J) College, a small, private, four-year school just south of Pittsburgh, Pennsylvania, were afforded the chance to travel to the country of Costa Rica, where they participated in a water quality and contamination research study. Together with their faculty mentor, the students traveled to various regions of Costa Rica to sample river water downstream from population centers and industrial activity. Water samples were collected at numerous river sites and tested for mercury and other contaminant metals, as well as petrochemicals, that could be washed into river systems as a result of urban residential, manufacturing, or commercial agricultural activity. This project alone was a high-impact experience for the two students who were fortunate enough to participate in the field; however, once back on campus, the data collected and the field experience design have resulted in opportunities for numerous additional students, as well. ArcGIS has played a central role in enriching learning for students. Through the use of joins and relates in the software, students have been able to integrate the field data collected in Costa Rica into existing GIS data in a lab setting to explore spatial relationships. For example, they can investigate the relationship between the prevalence of various river contaminants and their proximity and impact to such areas as sea turtle nesting grounds. In turn, students are able to use GIS to model and analyze upstream zoning, environmental mitigation, and compliance enforcement efforts as they relate to contaminated rivers. This hands-on approach, using authentic data, has markedly improved students' comprehension and retention of spatial skills and competencies. Further, the use of authentic field experiences and ArcGIS analysis has been successfully replicated in less expensive and less travel-intensive ways closer to home. Southwestern Pennsylvania, where W&J College is situated, is the current heart of Marcellus shale natural gas exploration and development. Hydraulic fracturing, or "fracking," as it has come to be known, is a primary process used in the extraction of shale gas—a process that yields thousands of gallons of contaminated water each day at sites throughout the Marcellus formation region. Much of this water finds its way into natural waterways in the college's immediate vicinity. Students are now able to learn about, research, analyze, and report on issues in the area they call home, adding a sense of personalization and urgency to their college experience. Some of these students come from families that earn their livelihood in the natural gas industry, so an inherent opposition to gas drilling is not prevalent, especially prior to lab exercises. As students have collected and analyzed water quality data, an appreciation for the impacts of fossil fuel exploitation has been observed, opening the door for meaningful and informed conversations about meeting the world's energy demands while caring for an increasingly taxed planet. Through high-impact learning experiences such as these, a generation of college graduates armed with an understanding of competing forces and the ability to use tools such as ArcGIS to make informed decisions is what is needed to strike the delicate balance required for future energy and environmental stability. Dr. Matthew North is an associate professor of information technology leadership and an affiliated faculty member with the Environmental Studies Program at Washington & Jefferson College in Washington, Pennsylvania. He has published works on GPS and GIS technologies and is the author of Life Lessons & Leadership, Agami Press, 2011. For more information, contact Matt North (e-mail: mnorth@washjeff.edu). The author offers sincere thanks to Dr. Robert Hijmans of the University of California, Davis, for the use of GIS data from the DIVA-GIS project.